The piece looks to be a lithograph with black ink lines added. The artwork is very well done and appears to be in very good condition. 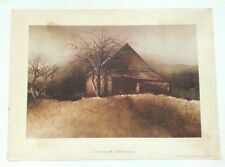 SIGNED LATE AFTERNOON BY HUBERT SHUPTRINE ART PRINT 1974 OXMOOR HOUSE 15" x 11"
12 1/2" X 8 1/4" ONLY THE INSIDE PRINT. 15" X 11" (ENTIRE PIECE). You just may find another perfect piece to add to your collection or send as a wonderful gift! The pictures are of the actual item…. It's signed and situated on the right bottom corner. Good condition as shown by the following pictures. For our French-speaking friends: Gravure estampe du Vieux Lisieux par Bernard. Signé et situé en bas à droite. This would be a great piece of decor to place on a wall without a window. It is a must have piece of art. OUTSIDE LOOKING IN PRINT. Edita von Uslar-Gleichen Framed Artist Reproduction "The Lincoln Memorial-Snow"
Edita von Uslar-Gleichen Framed Artist Reproduction "The White House in Snow"
Edita von Uslar-Gleichen Framed Artist Reproduction "The Capitol in Snow"
FINE ART REPRODUCTION PAPER SUITABLE FOR FRAMING. PAPER SIZE 11" X 14". WE WILL TRY OUR BEST TO SOLVE THE ISSUE. Rene Beauregard House. Lithography Sketch. Artist - H. A. Perez. Site Of The Battle Of New Orleans. The print is dated 1985 and signed in pencil by Mark Monsarrat in 1990. It is a 1" thick oak with thin walnut inner border. Title: Chunlan (Dancing Butterflies) – 春蘭 ( 舞蝶). Artist: Chizuko Yoshida (1924 - Present). Signed/Sealed: Signed “Chizuko Yoshida” lower right margin. Brulatour Courtyard. Lithography Sketch. Artist - H. A. Perez. New Orleans, Louisiana. This listing is for a single vintage print from John Marin's body of work. It is of a watercolor titled A Town in Maine. ►Condition: This is a vintage print in like new condition. It has been kept in the original packaging since printing & distribution, away from light. No bends, tears, discoloration, or other issues. It will be shipped rolled in a wide tube. ►Shipping: Additional rolled paper items SHIP FOR FREE. Applies to domestic and international orders. ►Related: This store has several other John Marin prints from the same collection available, as well as a set of 5 prints. 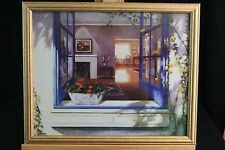 See the full description for links..
Thomas Kinkade Framed Canvas Print With COA. Frame Is 14x12, Actual Art Is 9x7. 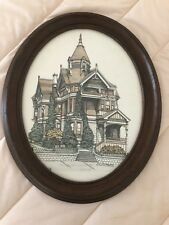 Thomas Kinkade Framed Canvas Print With COA. Frame Is 14x14, Actual Art Is 9x9.. Shipped with USPS Priority Mail. Has imperfections.discolorations etc. older and shows wear. Only one has glass. One is of a Victorian style house which is located near water. The other is of a small cabin that is near a boat dock. About the artist: Mark was born and raised in London, England. He was schooled in the arts at the Royal College of Art, London, the Academy of Fine Art,Berlin and Academy of Cinematic and Graphic Art, Berlin. Thomas Kinkade Framed Canvas Print With COA. Frame Is 14x14, Actual Art Is 9x9. There is a white slatted and column fence lined with flower bushes in full bloom. Would go well with most other decor. About the artist: Betsy Brown's prints have been delighting us for years. Whatever the reason, what touches Betsy personally seems to affect so many others drawn to her work. Antique Wood Frame SW View Old State House Unsigned Artwork Print? Lithograph? Marked, “S.W. View of the Old State House”, there are no artists signature or other makers marks found. 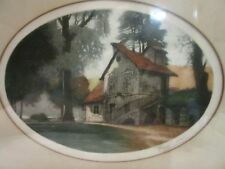 This listing is for the wood framed oil on canvas (American, early 20th century) painting shown. Measures approx. 18" x 14.5" to outside of frame - exposed painting is approx. 14" x 10.5". 1906. Signed. Great original oil painting by J.K. Righter. Hans Clatt, made in Bavaria, stream, house, fall, Germany, colored print, art. Beautiful TK painting canvas in mint condition! 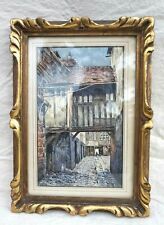 This is a Thomas Kinkade art print, "Open Gate, Sussex" by the Collectors' Society. The mat is a ribbed texture. VGC Ready to display. Double matted. Text and woodcut of River Front, Montreal, on verso. The green shutters were useful during the hurricane season. This is a print made from my original watercolor painting, which was painted in 2004. We are sad to inform you that artist, Alan Ferguson, has lost his long battle with prostate cancer. Condition: FINE USUAL AGE WEAR. The Little Red School House was built in 1852, was moved in 2006 to the Franklin County Fairgrounds in Farmington, Maine and is now used as a Historical Museum. The Art Work that was included in the 1971 Historical Booklet was done by Local Artist C. Robert Tyler and included THE LITTLE RED SCHOOL HOUSE Watercolor on the Cover. FINE ART REPRODUCTION PAPER SUITABLE FOR FRAMING. PAPER SIZE 11" X 14". IMAGE SIZE 9" X 10".